Eat Your City: Cheeseburger wraps recipe – self explanatory – a cheeseburger but as a wrap! Cheeseburger wraps recipe – self explanatory – a cheeseburger but as a wrap! I had a craving for a cheeseburger the other day… the urge to sink your teeth into a juicy well seasoned burger, just a slight bit of charcoal from the grill, lettuce, tomato, ketchup, mustard, mayo... mmm! Problem was, it was late and most half decent burger places were already closed as their owners would be dreaming of sugarplums, manatees or being on Top Chef... or something. So I rummaged through my fridge to see what I could toss together to satisfy the craving and to bring for lunch the next day. 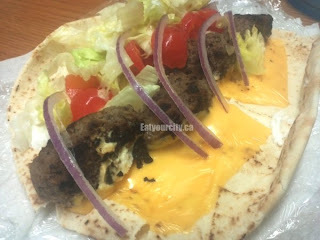 I had lean ground beef, some onions, some soft pitas, cheese, veges.. and the cheeseburger wrap was born! This is a pretty simple recipe, I prepped and cooked everything in under 20min. Bonus! I used some kraft processed cheddar slices for that old school cheese burger taste, but you can easily punch it up by using spiced havarti, smoked gouda, swiss, feta, or whatever you have in your fridge. As I used lean ground beef to reduce fat, I added in breadcrumbs and eggs to prevent a super dense dodgeball like texture and increase the moist juiciness of the burger. If you use regular ground beef, then you don’t need the bread/egg – they add moisture and increase juiciness of burger.. lean and extra lean burgers need em! For lunch the next day, I heated up my wrap, cheese and burger “tubes” in the microwave, then topped with sauces and veges. Boy were people jaaaaaalous! Cheeseburger wrap recipe Makes 4 wraps.. one for me, 2 for me, 3 for me...and one more for me lol! 1) In a large bowl, combine ground beef, worcestershire sauce, mustard, wine, egg. breadcrumbs and spices together. I use disposable kitchen gloves to mix things up fast and evenly. 2) Form into 4 patties if you plan to cook on the grill or smoosh beef mixture into sausage like shapes if you’re planning to cook on the stovetop. 3) Heat up the grill to medium high and grill for 4-5min. If cooking on stovetop, heat olive oil on a non-stick frying pan over med-high. Cook 4-5 min. Use meat thermometer to make sure internal temps reaches 165F minimum. 4) Assembly time! 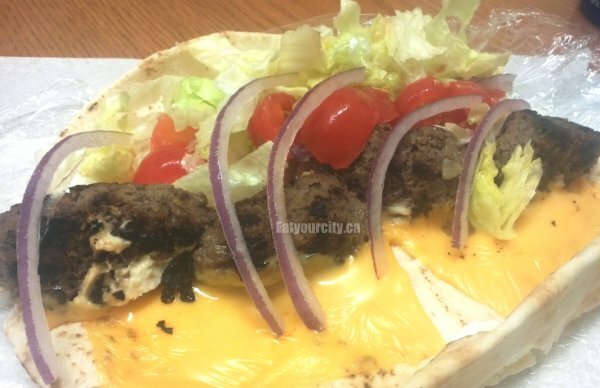 Place cheese and meat burger/links onto wrap. Toast or microwave the wrap until cheese melts and meat is hot. Top with your choices of condiments and veges.. dig in!